March High 5 Moments at H5C! Hey High 5-ers happy April! We cannot believe the first 3 months of the year have came and went. March brought five new games to High 5 Casino: Secrets of the Pixies, The Swordsman, The Leprechaun King, Cocktail Cash and Jenson Matlock and the Gold Peacock. Our first Lucky Doublin’ XP Event where players were given the opportunity to play selected games and increase their game level 2 times faster! Celtic Courage kicked off the event on March 15th and The Green Machine Global, All that Cash, Lucky Horse, Lucky Rooster and The Leprechaun King followed with Double XP’s until March 23rd! 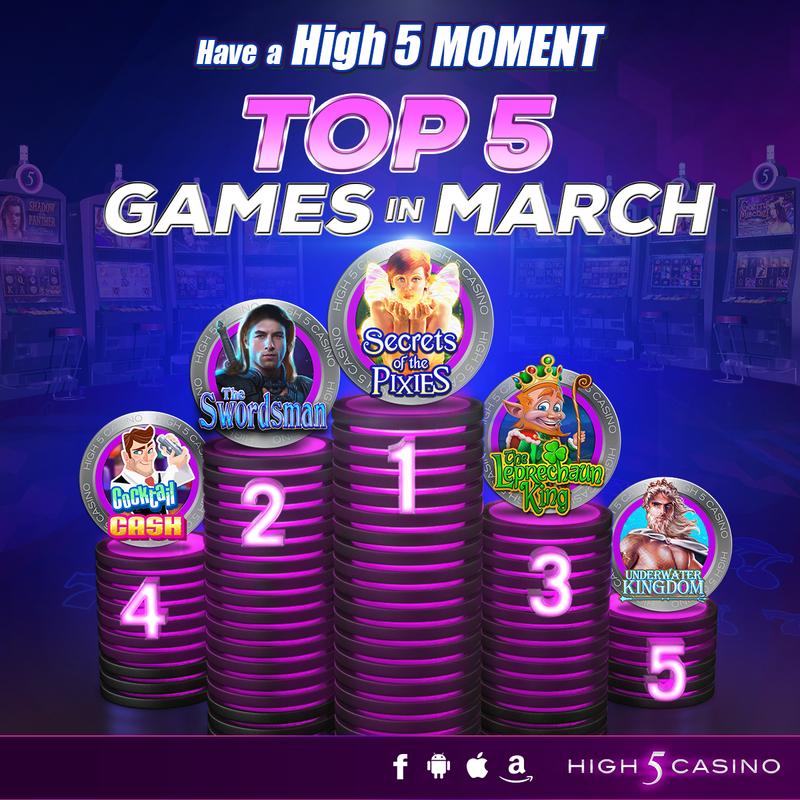 The month of March also brought High 5-ers more ways to earn Club High Five VIP Points by playing High 5 Vegas on Facebook Desktop, iOS and Android and our newest app Electri5 Casino on iOS and Android! Our favorite part of March was reading the thousands of entries in H5C’s My Favorite Slot Contest, where High-5ers entered to win 200k coins by telling us their favorite H5C Game and why! It is evident that you, High 5-ers love High 5 Casino because in March 4,128,133 hours were spent playing at our casino! Top 5 most played games for March: Secrets of the Pixies, The Swordsman, Leprechaun King, Cocktail Cash and Underwater Kingdom! What was your favorite game this March? Which game gave you your High 5 Moment? Comment in the conversation bubble located on the top right corner of your screen and let us know! This entry was posted in H5C Stats, High 5 Casino, High 5 Games, High 5 Vegas, statistics, top games and tagged Android, App Store, Apple, Facebook, Free Games, High 5 Casino Mobile, High 5 Games, High 5 Moment, iOS, iPad, iPads, iPhone, iPhones, mobile gaming, slots, social gaming, statistics by hoothigh5. Bookmark the permalink. The Leprachaun game & Cocktail game!